Jim Stroud – Page 85 – Exploring the future of work, life and everything in between! Last year I gave a job-hunting webinar that focused on the in-between time between full-time roles. As you get anxious for the next interview and as you try to stretch your unemployment benefits, you need some income and you need it NOW! So, with that in mind, I share various ways you can legally make money doing what you already know. What do I mean by that? Simply put, industries are hot one minute and then laying off the next. 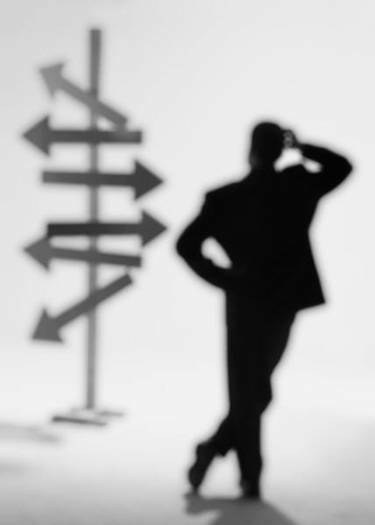 You can give your life to a particular trade and before you know it, you are replaced by some form of technology. How can you safeguard against that? Well, one way is to put your tax dollars to work. The Bureau of Labor Statistics is a government agency that studies and measures what is going on in the world of labor. One of the studies it focuses on in particular is Occupational Projections. In other words, they see what has been hot and by using statistical data, they make their best guess on what will be hot later. Let me show you how it works. Step 3: I review the data and make a judgement call. This is what the data is telling me. In 2008, there were about 207,900 Recruiters employed and by 2018 there will be about 265,900 thousand Recruiters employed. Is the average salary of the job I am considering fitting my lifestyle (or at the least, the lifestyle that I want)? Will there be a significant number of jobs for me over the next few years? If I ever wanted to make this job a self-employed business, what are the chances of that? If a college degree is the most significant source of training, am I willing to devote time towards that goal? BONUS QUESTION: If I am entering college now, am I studying (and spending my parents money) on something that may be difficult to get a job for later? What are the chances that I will get a high ROI on my degree? I hope this gives you some good food for thought? I look forward to reading your comments below. One sure way to get a jump on your job hunting competitors is to apply for work before the job description is even written. How does one do that? Simple. Look for news stories that feature companies that are planning to make massive hires! More than likely if a company is going to hire hundreds of people at a time, they are not going to post those hundreds of jobs on job boards at once (especially in this economy). What then? Network with people who work at those companies and send in your resume ahead of time to Recruiters. In this way, you get to be among the first in line. To support its new $500 million, 5-year strategic engagement with Merck & Co., IT-services firm HCL Americas will be adding at least 100 new positions at its services-delivery center in Cary, North Carolina. A Dallas-based company owned by Xerox will open a call center in Oklahoma City and hire 500 people. Affiliated Computer Services will open the call center in December. Lockheed Martin Corp. wants to spend $2.4 million to renovate and equip a 64,000-square-foot industrial building in the city of West Melbourne and create 100 jobs. 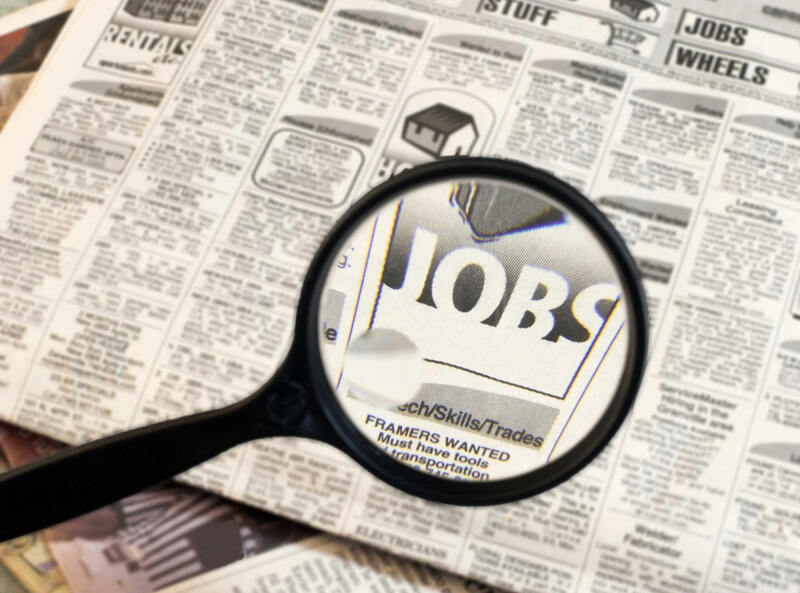 Pulaski Co., VA – New jobs are coming to Pulaski County. Governor McDonnell has announced that Phoenex Packaging Operations is investing more than $20 million to open an operation in the county. The project will create more than 240 jobs. Costa Mesa CA, May 7, 2010 — UNITED ERRANDS EXPRESS is the world’s premier Open Online Market Place for 24/7 On Call Concierge Services and we are hiring. The Rancho Las Palmas in Rancho Mirage is hiring 80 people in anticipation of a very busy summer. When fully staffed, the Clayton Distribution Center could employ up to 600 people, depending on market demand. Solar-module manufacturer SolarWorld has announced that it is adding about 350 jobs at its factory buildings in Hillsboro, Ore. Attention L.A. Writers: MTV News Is Hiring! The Louisiana Workforce Commission is currently taking applications for 500 new jobs being created for the oil spill clean-up. Diversified technology giant General Electric Co. (GE) Monday stated that it will create more than 1,300 new jobs in the state of Michigan over the next five years in technology, software, manufacturing and sourcing. This is an expansion from the company’s previous commitment of 1,100 new jobs in the state by 220 people. Silver Line Windows, an Andersen Company, is hiring at its Marion plant, a company spokeswoman said. The plant began hiring about April 1, when it had about 500 employees. The business now has 670 workers with hopes of hiring about 100 more, Maureen McDonough said. Pioneer Hi-Bred, a DuPont business, is building a second research and development center in Puerto Rico that will create up to 100 new jobs on the island, which is home to a thriving agro-biotechnology cluster. Ohio Governor Ted Strickland today joined ConAgra Foods representatives and local officials to kick-off the company’s expansion at a ground-breaking ceremony at its Troy facility. The expansion is creating 190 jobs in Ohio. Affiliated Computer Services is hiring 850 temporary workers for online document processing at its facility on Fortune Drive in Lexington, the company announced Tuesday. In case you are wondering how I came up with this list, I did a search on Google News. If I wanted to refine it further, I could show news posted in the past hour, day, week, month, et cetera by clicking the links on the left side of the screen. If you meet a Recruiter during your networking activities, don’t waste your time talking to the wrong one. Although many people believe the contrary, there is no one size fits all when it comes to Recruiters. When I was Recruiting for Lanta Technology Group (way back in the day) I staffed startup companies, mostly Executive and Technical talent. (Good times.) As such, I was always on the hunt for new talent and new business, so I networked all the time. 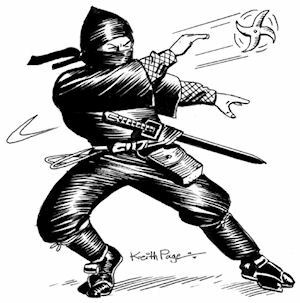 It was not uncommon to meet someone, introduce myself as a Recruiter and get tossed business cards and resumes like.. like… opportunity seeking Ninjas on a mission. So many times I wanted to say (and have on several occasions) that I cannot help you, try talking to this other recruiter guy I know. When I did that however, I could see in their faces that they thought I was being rude and (honest) I was not. I worked in a particular niche and built my contacts there, so if someone handed me a resume for a School Teacher or a CPA, I had no leads. I wish back then that I could have directed people to FollowerWonk. It would have saved me a lot of time. You know what I mean? Hm… Maybe you don’t. Followerwonk is a search engine for Twitter bios and it is soooo simple to use. 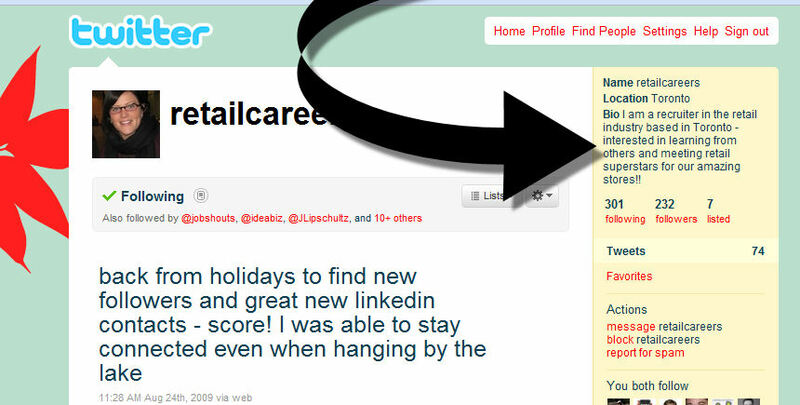 All you have to do is add in your key terms like, um… recruiter and retail (assuming of course that you are looking for work in the retail industry), then click the “Search Twitter Bios” button. 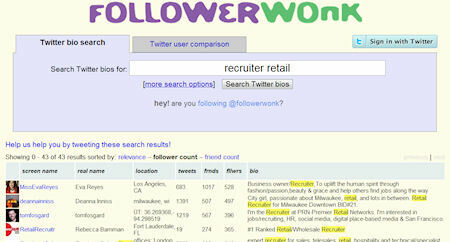 Followerwonk will then search Twitter for people who have used the terms “recruiter” and “retail” in their descriptions. 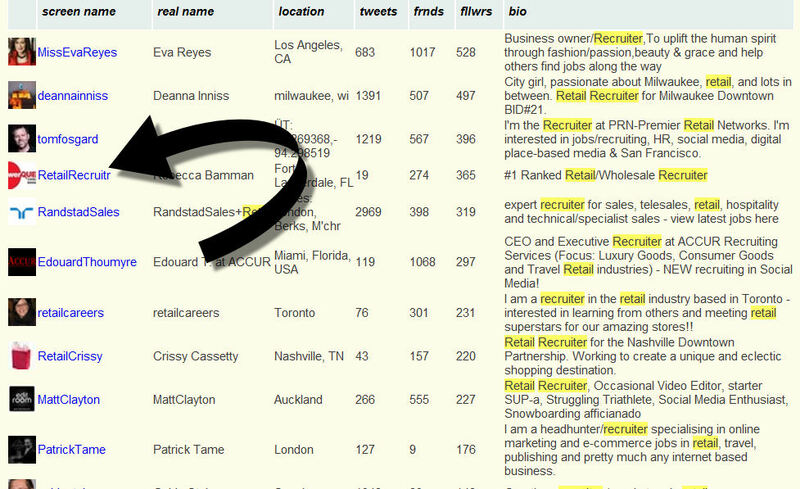 You will no doubt notice that the words “recruiter” and “retail” are being highlighted. Let’s go a bit deeper and click on one of the links provided. Well, lookee here! –> I am a recruiter in the retail industry based in Toronto – interested in learning from others and meeting retail superstars for our amazing stores!! Try using Followerwonk to find recruiters in your niche and save yourself some time. Make sense? Hmm… Now that I think about it, it would not have mattered if Followerwonk was around during my Lanta days because Twitter had not been invented yet. Oh well, nevermind. Although I hate taxes as much as the next guy, I have to appreciate some of what I get for my money. Case in point, how often do you check the U.S. Bureau of Labor Statistics? Okay, there was a time would I would have said “never” as well. However, I feel myself being pulled back to it from time to time because of the piles and piles of data it has. For example, late last year (or was it early this year?) the BLS published a report called “Employment Projections: 2008-2018 Summary.” What did it do? In a nutshell, it looked at a bunch of numbers and predicted which industries would boom over the next decade and which one would go the way of the dinosaur. * As Baby Boomers grow older and continue their trend of increased labor force participation, the number of persons ages 55+ in the labor force is expected to increase by 12 million, or 43% percent, during the 2008-18 period. Those ages 55+ are projected to make up nearly one-quarter of the labor force in 2018. * Young people (age 16-24) are expected to account for 12.7% of the labor force in 2018, and persons in the prime-age working group (ages 25- 54) to account for 63.5% of the 2018 labor force. * Hispanics (who can be of any race) will join the labor force in greater numbers than non-Hispanics. The number of Hispanics in the labor force is projected to grow by 7.3 million or 33.1%. Their share of the labor force will expand from 14.3% in 2008 to 17.6% in 2018. * All but three of the top 30 fastest-growing detailed occupations are found within professional and related occupations and service occupations. Seventeen of these rapidly growing occupations are related to healthcare or medical research. So there you have it ladies and gentlemen, your tax dollars at work.